Home » Posts Tagged "Chris Lavish"
Seen on scene, Chris Lavish and lovely friend. 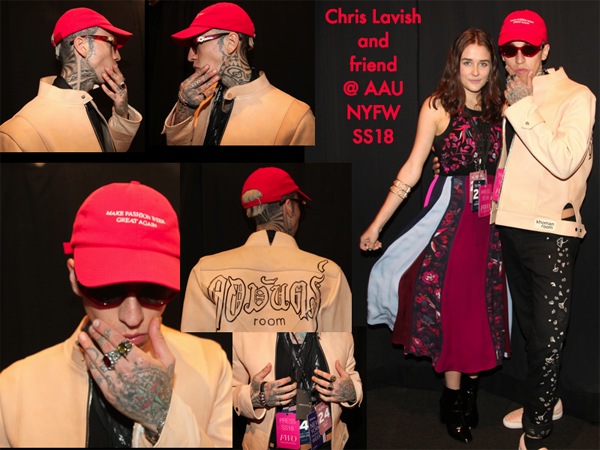 The self-described “Intergalactic Tattoo Module” is wearing a ton of tattoos – and there’s sure to be more we can’t see – with a Khoman Room leather jacket and pants, Versace glasses, a hat that says: “Make Fashion Week Great Again” – yes, oh yes, please! The Columbian-born, New York-based 6′ 2″ tattooed model of RNWY.com is with AgencyModels.com (@nycclavish on Instagram) and is seen here with Clara Pasevanto-Meyer (@Savento / Clara@fashionweekonline) in a Tanya Taylor dress, Jessica Simpson shoes, Top Shop bracelet. They are photographed backstage at the Academy of Art University (AAU – @academy_of_art) School of Fashion show during New York Fashion Week for Spring/Summer 2018. Stay tuned for larger photos of each image in the Scene album, photos of the hair and fashions, all to be archived on the website, and to see the great hair by Aveda’s Jon Reyman.